The Italian coach is widely expected to step down following his side’s loss to Austria last night. O'Neill has been linked with the job before and the FAI are understood to have approached him at least once. IN AN IDEAL world, Martin O’Neill would not be the front-runner for the Ireland job, as Giovanni Trapattoni’s exit looms following last night’s tame loss to Austria. But Irish fans are kidding themselves if they think they can get a truly top-class manager installed in what many coaches will regard as a poisoned chalice. Indeed, even the prospect of hiring a fading great with an excellent past pedigree á la Trapattoni is highly unlikely. It is not anticipated that the FAI and Denis O’Brien will be quite so generous this time around, given the country’s increasing economic woes and the fact that, while by no means a failure, Trap was hardly worth the exorbitant levels of cash they’ve been spending on him for the past five years. Accordingly, with most fans now well and truly sick of the Italian, the association are likely to yield to public opinion and go with someone whose values are the antithesis to those of the 74-year-old; hence O’Neill would seem like an obvious choice in this context. Yet while he would surely be a fan favourite, the Northern Irishman might be viewed as a flawed appointment in some circles. After all, it could be argued that he hasn’t been an unequivocal success at any club he’s managed since Leicester City. He was sacked by Sunderland as they were one point above the relegation zone, he left Villa in dire straits by resigning just five days before the start of the new season, and even at Celtic, he lost nearly as many league titles as he won. Yet a closer examination of the stats reveals he did a decent-to-great job at each of these clubs. He was Celtic’s most successful manager since Jock Stein. He also helped the Scottish club qualify for the group stages of the Champions League in four of his five seasons in charge there (and oversaw their run to the UEFA Cup final the one time they were beaten in the third qualifying round of Europe’s biggest club competition). Similarly, while his stints at Villa and Sunderland were less memorable, it was by no means disastrous on either occasion. One need only look at where both these clubs have ended up since to get an accurate measure of O’Neill’s worth. Villa finished sixth three seasons in a row under the Northern Irishman, and endured a drastic decline once he left. His time at Sunderland was marred by a disappointing second season in charge that ultimately cost him his job there, but as with Villa, they are hardly better off without him, and currently sit joint bottom in the Premier League under Paolo Di Canio, having just lost 3-1 to Crystal Palace. O’Neill would likely be a popular choice among fans and it seems the right time for him to take over too. His disappointment at Sunderland means an immediate Premier League return is improbable, and the only obvious alternative would be a Championship club. At 61, the less rigorous regime that the Ireland job would entail may seem more appealing to O’Neill, rather than roughing it up with the likes of Yeovil and Doncaster. And there would be plenty of benefits from Ireland’s perspective too, chiefly, his European experience. While they may have had a notoriously poor away record in the Champions League, by and large, O’Neill excelled in such situations with Celtic. They frequently punched above their weight during his reign, beating teams as eminent as Barcelona, Liverpool and Lyon. Ireland now would not be of too dissimilar a standard to the Scottish side then, and unlike Trap, O’Neill has vast experience in helping smaller teams punch well above their weight. Moreover, rather than publicly ridiculing his players as Trapattoni has tended to do all too often, O’Neill would surely infuse the Irish team with the self-belief they so patently need. While his temperamental tendencies may not always please everyone, the Northern Irishman’s motivational skills are well documented. And his pragmatic approach with Celtic in Europe prompted him to adopt a 4-5-1 formation for most away games, so we would surely see an end to the dreaded 4-4-2 style relentlessly favoured by Trap were he to take over. O’Neill’s tactics would hardly be overly sophisticated either, as his teams rely on a long-ball game more often than not. Nevertheless, his sides are bound to be less cautious and consequently, more entertaining than Trap’s and he is willing to experiment and give youth a chance — the sudden integration of James McClean into the Sunderland first team under his tenure constitutes a prime example. It is therefore hard to imagine an O’Neill-managed team ending a vital game with such a whimper, as Ireland did last night. In addition, when you look at the other names being mentioned, the case for O’Neill grows even more compelling. Roy Keane, by contrast, would surely represent too much of a gamble. Indeed, there is something Trapattoni-esque about the Corkonian’s managerial style as evidenced by his tendency to fall out with and subsequently ostracise players (Liam Miller, Dwight Yorke), coupled with the occasional, inexplicably odd decision (selling Jordan Rhodes to Huddersfield). Another name that has been bandied about is René Meulensteen — the former Manchester United coach, who was controversially sacked as Anzhi Makhachkala manager, after just 16 days in the role. Appointing him would be both brave and ambitious, and could pay dividends, but his lack of a managerial track record means he would surely be too much of a risk. And even allowing for his shortcomings in this department, the FAI will hardly be keen on hiring another foreigner from left field — especially one who also has an ostensible penchant for abstract footballing philosophies. However, of all these candidates, Roy Keane may be more of a possibility than people think. Of course, he has never been on the best of terms with the FAI, but if he is willing to bury the hatchet and work with Niall Quinn at Sunderland, then surely the same rules must apply in relation to John Delaney. Meanwhile, the FAI, given their well-documented financial troubles, may find the Keane brand difficult to resist, as it’s hard to think of anyone else more naturally adept at generating publicity and attracting big crowds than the fiery ex-Manchester United midfielder. Yet, from a less romantic perspective, it seems O’Neill is both the most sensible and viable choice. He is effectively everything that Trapattoni is not and would thus represent a welcome-if-imperfect antidote. Email “Opinion: Martin O’Neill is the right man to replace Trap as Ireland manager”. 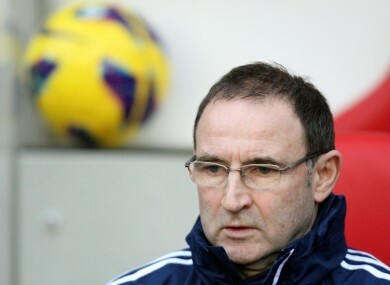 Feedback on “Opinion: Martin O’Neill is the right man to replace Trap as Ireland manager”.